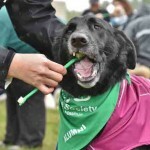 2020 Vision Quest | Wags to Whiskers and the Toothbrushing Record: Help Autumn into the Guinness Book of World Records! What is this Wags to Whiskers World Record All About? We will be attending and hope you will consider joining us! 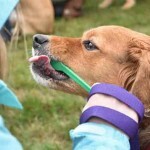 We already brush Autumn’s teeth regularly to promote her best health and happiness. We also support our friends at the Humane Society of Greater Nashua who have invited Autumn to be Bib#1 in the charge for the world record attempt at their incredible festival this year. 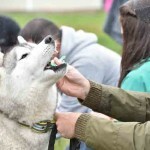 While there are many great reasons to attend the festival and we hope you will do so vor all of those reasons, we especially want you to bring your dogs along as we need your team to add up our number tally of most dogs simultaneously having their teeth brushed. RSVP now! or get more information on the festival. “Whoa, Randy!? You want me to brush my dog’s teeth?” I absolutely do and not just for this festival, though that’s the first focus to help us reach the goal. I think it would be great for you and your dog for a long time to come and I’m willing to show you how easy this can be for both of you. First, understand that toothpaste for a dog can be found at your pet store. They have such delicious flavors as liver or chicken, though you may be tempted by the ever refreshing mint! The toothpaste is enzyme-laden so that even just licking the toothpaste, which most dogs will love, is a benefit to their dental hygiene. Still there are multiple types of brushes for the plaque which can otherwise build-up. My favorite is the finger brush. While admittedly Autumn does not love that I’m trying to brush where plaque builds up at the gum line, she loves the flavor enough that it’s a special treat. When we finish I let her lick a little extra toothpaste and if she’s been patient a Greenies toothbrush treat helps to work into those hard to reach places as well. All this sounds simple and I’ve even made a quick video to show you. So please take this lesson to heart and consider the better health of your pet as well as the quality bonding time added to your time together. I also strongly urge you to join us for the Wags to Whiskers Festival where we’ll have a chance to finally get over the top and reach the world record with your help. Remember that the RSVP and registration will help us know we have the numbers to reach our goal. I’ll look forward to taking the time to let Autumn meet all of her friends when we are not actively working and we can team up to help the Humane Society of Nashua continue their great work! 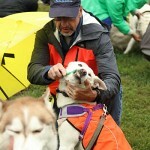 Photos in this entry depict the toothbrushing Guinness World Record attempt at the 2016 Wags to Whiskers Festival and are courtesy of the Humane Society of Greater Nashua.